PR: Apple has introduced the new iPod, featuring a gorgeous 2.5" color screen that can display album artwork and photos - and play stunning video including music videos, video podcasts, home movies, and television shows. The new iPod holds up to 15,000 songs, 25,000 photos, or over 150 hours of video and is available in a 30 GB model for $299 and a 60 GB model for $399, with both models available in stunning white or black designs. "The new iPod is the best music player ever - it's 30% thinner and has 50% more storage than its predecessor - yet it sells for the same price and plays stunning video on its 2.5" color screen," said Steve Jobs, Apple's CEO. "Because millions of people around the world will buy this new iPod to play music, it will quickly become the most popular portable video player in history." The new iPod plays music, audiobooks, audio Podcasts, video Podcasts, home movies, music videos and popular television shows like Lost and Desperate Housewives. The unrivaled combination of iPod and iTunes 6 now provides customers with a seamless experience for buying, managing and playing video as well as audio content, including over 2,000 music videos, six short films from the Academy-Award winning Pixar Animation Studios, and five television shows from ABC and Disney Channel, including the immensely popular Lost and Desperate Housewives. The new iPod combines all of the ground breaking features that have made the iPod the best music player in the world with revolutionary new features such as the ability to view video content on a larger stunning color display. The new iPod features Apple's innovative Click Wheel for precise, one-handed navigation and the portable design is ideal for putting music, Podcasts, photos, audiobooks, home movies, music videos and popular television shows in a pocket for on-the-go viewing. iPod users can also watch their video content and slideshows of their photos on a television via optional Apple accessories. * Battery life and number of charge cycles vary by use and settings. See http://www.apple.com/batteries for more information. Music capacity is based on four minutes per song and 128-Kbps AAC encoding; video capacity is based on H.264 750-Kbps combined with 128-Kbps audio; and photo capacity is based on iPod-viewable photos transferred from iTunes. The new iPods will begin shipping next week for a suggested retail price of $299 for the 30 GB model and $399 for the 60 GB model through the Apple Store, Apple's retail stores, and Apple Authorized Resellers. 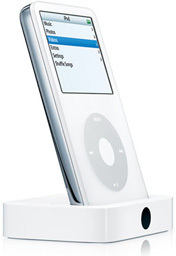 All iPod models include earbud headphones, USB 2.0 cable, case, dock insert, and a CD with iTunes for Mac and Windows computers. Optional accessories designed for the new iPod include: Universal Dock for $39, giving users easy access to a USB port for syncing, IR support to work with the Apple Remote and a variable line out and S-video connections for integration within the living room; Apple Remote for $29, providing wireless integration to the Universal Dock and quick and easy access to controls from across the room; Apple iPod AV cable for $19, enabling television viewing of video content in full-screen; the iPod Camera Connector for $29; and Apple Socks for $29 providing six vibrant color socks to dress up and protect your iPod. iPod requires a Mac with a USB 2.0 and Mac OS X version 10.3.9 or later and iTunes 6; or a Windows PC with a USB 2.0 port and Windows 2000, XP Home or Professional (SP2) and iTunes 6. "Piper Jaffray expects Apple Computer to top fiscal fourth-quarter (ended September) earnings estimates and to have a 'very strong' fiscal first quarter, in both Mac and iPod segments. "Piper Jaffray recommended investors to 'continue to be buyers of Apple shares' and raised estimates to incorporate sales of the iPod nano." "You've no doubt seen the hilarious spoof video that's making the rounds on the Web advertising the 'iPod Flea,' a digital music player so small that it can hold only one song. After Apple released its minute iPod Shuffle last year, few were betting CEO Steve Jobs and crew could do much to top the player's gum-package size. "Enter the iPod nano. Available in either glossy black or white versions, it's so small that pictures and billboards really don't do it justice. Since apparently the iPod mini was not mini enough, Apple decided to confront increasing competition in the digital music player space with the Nano, which at 3.5 inches long, 1.6 inches wide, and a minuscule 0.27 inch deep, looks too fragile for everyday use. 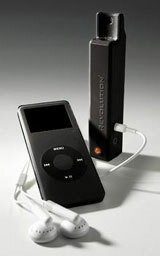 "To Apple's credit, the Nano jettisons many of the problems that plagued previous iPod products. Like the Shuffle, it features solid-state flash memory in place of a hard drive, whose platter and spindle system is prone to damage when dropped. And one-upping the Shuffle, it adds a 1.5-inch LCD screen, which offers better navigation through the contents of the device. Apple will phase out the iPod mini, a move expected to make the Nano its de facto biggest seller." "With technology advancing at a frighteningly quick pace - think Michael Jackson's zombie army from Thriller - MP3 players are getting smaller, or as Apple declares, "impossibly small." Last month, Apple announced the newest addition to the iPod family. At 1.5 ounces, the iPod nano is not only cute and pencil-thin, but also fits inside an empty pack of Orbit gum. (Say hello to the world's cheapest iPod case). Even on a campus where it seems like everyone carries an iPod, the tiny iPod nano is sure to overshadow its predecessors. "Although the truly special aspect of Mr. and Mrs. iPod's little newborn is its size, skeptical consumers may be quick to point out that size doesn't matter. While that may be true in other aspects of life, the nano boasts many other impressive qualities. Presently, the nano comes in two colors: the standard white model and a sexier, more sophisticated black version (without the aesthetically-displeasing red click wheel featured on the iPod U2). 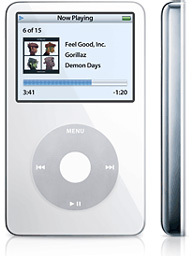 The nano clocks in at 3.5" x 1.6" x 0.27", making it the slimmest iPod on the MP3 scene since the iPod shuffle. Compare its saucy little figure to the hulking 60 GB fifth generation iPod, coming in at 4.1" x 2.4" x 0.75", and it's easy to see the light." "Everyone's favorite Apple marketshare analyst, Piper Jaffray, has pointed out that surveys among teens in the market for digital music players and online music purchases indicate an increase in Apple marketshare, not a plateau or decrease as previously predicted. '"We believe the teen market is a critical demographic in digital music,' said Analyst Gene Munster. 'Apple appears to be winning mindshare at an early age, which we expect will pay off as students become more significant consumers over the next decade.'" "Just about three weeks ago I posted a review of my new favorite gadget, the iPod nano. In that review I called the device, 'The coolest thing I own bar none' and that wasn't an exaggeration or another way of saying that I don't own cool things. Well I'm sad to report that my nano had accidentally had a run-in with the washing machine on Saturday morning. "The nano is light enough that it turns out you can't really tell when it's in a shirt pocket and when it's not. On this Saturday morning it was, and unfortunately the shirt was in the washer. I got ahold of it after about a minute in the dryer, so the little white contraption had already experienced a warm wash, cool rinse and exciting spin cycle. It was non-responsive and if I was an ER doctor the nano would have been pronounced dead...."
"Funding for the iPods comes from a grant given to the Language Resource Center, which makes foreign media available to students. The LRC has 130 iPods for students, not all of which are being used. Computing and Information Services was responsible for acquiring the iPods and conducted all communications with Apple. "Though students are being given the iPods free of charge, certain restrictions do apply. Students can keep the iPods only for the semester and must return them on Dec. 20. If an iPod is damaged or lost, the incurred cost will be charged to a student's account." Ebates, the world's largest shopping portal that gives consumers cash back every time they shop online, today announced it has updated its Apple iPod Buying Guide with information on finding a cheap iPod nano - this season's hottest consumer electronics item. Ebates.com is a shopping portal - users start there, then click through to more than 800 trusted retail sites like Apple, Circuit City, and Buy.com, to name a few. Ebates also presents money-saving coupons that can be combined with cash back savings for even bigger discounts off already low Internet prices. "Ever need to take your email with you from one computer to another? Can't or don't want to use IMAP? Like the idea of using your iPod or memory stick to store your Apple Mail messages? "I know I have the options of IMAP or even .mac to keep my email central, but being involved in several different enterprises I've got 8 different pop accounts to keep track of and my Mail folder is 3 Gigs in size . . . Accessing all that data over the Internet, just isn't an option for me." PR: FastMac announces the first iPod battery recycling program available at no extra charge, to all customers who purchase a TruePower iPod battery upgrade from FastMac. This program is also available to the general public who purchase third party battery replacements and need to properly dispose of their original iPod battery. All disposal fees are covered by FastMac. FastMac will offer all purchasers of TruePower batteries a prepaid padded envelope for return of the original battery at no additional fee. Once received by FastMac, the battery will be properly disposed of at a recycling center where all usable chemicals and components will be recovered. To prevent the creation of excess waste the envelopes will be continuously reused. The customer is also given the option of bringing their original battery to a local battery recycling center or one of FastMac's 200+ authorized dealers. For customers who chose the "Professional Installation" option, the original internal battery will automatically be recycled. FastMac will also accept iPod batteries from customers of any third party vendors who do not offer recycling options. These customers can ship their battery directly to FastMac for disposal. See www.fastmac.com/recycle for the address and more information on local FastMac authorized dealers and battery recycling centers. "We make it easy to be green. FastMac's battery recycling program is a painless way to be good to the environment" said Michael Lowdermilk, Business Development Manager for FastMac Performance Upgrades. "With over 20 million iPods out there and millions more on the way the amount of battery waste that will be created in the next few years will have a significant environmental impact, unless companies do something to help." Proper disposal of these batteries prevents them from ending up in landfills where they have the potential to cause serious harm including contamination of ground water supplies. "FastMac wants to do it's part. Whether it's disposing of these power cells properly, regardless of where they were purchased, or developing products like our TruePower batteries that can last up to 7.5 times longer than any other lithium ion battery; the less waste, the better" said Edward Savio, President of FastMac Performance Upgrades, Inc.
PR: Tired of hearing about the iPod's battery problems? iPodMods have a solution for you with their Lifetime iPod Battery Replacement Service. The average iPod battery has a life span of about 500 cycles. After a year of average use, your battery will show signs of fatigue. 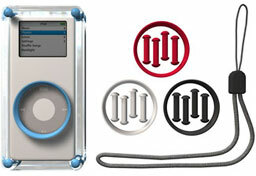 iPodMods is pleased to offer the iPod Platinum Battery program for all iPod owners. This includes the original iPod 1st generation, 2nd generation, 3rd generation, 4th generation, iPod mini, iPod shuffle, and iPod photo models. Once you buy the iPod Platinum Battery Service, iPodMods will replace your battery for as long as you own your iPod (once every 12 months). Simply purchase the iPod Platinum Battery service and select an installation option (self installation or iPodMods professional installation). Once your iPod has been received, iPodMods will install a brand new battery within 48 hours with around 30% more power than a factory new battery. When your iPod shows signs of battery strain after another 12 months, you'll be able to send it back to iPodMods for a fully juiced replacement. Call 1-888-763-6637 for any additional questions. All batteries come with a full one year warranty so if it needs to be replaced early, just send it back for a no-hassle replacement. PR: UpBeat Audio's new Boostaroo Revolution overcomes the low volume and flat sound problems sometimes associated with listening to digital music and movies on portable players. This pocket-sized audio amplifier and two-way splitter drives high-end headphones (greater than 60 ohm impedance for best results) or mini-speakers, quadruples their volume, and images high-definition 3-channel surround sound. The Revolution powers any portable player that has a headphone jack, including all iPods and other MP3 players, DVD, CD and satellite radio players, laptops, Pocket PCs, handheld video games and motorcycle intercom gear. Retailing for $79.95, it will hit the shelves later this month at Dr. Bott, ThinkGeek.com, effiliate.com, Airport Wireless, In Motion, AltiTunes, Boostaroo.com, and Hedonics in Canada. Weighing only six ounces, counting the two included AAA batteries, the Boostaroo Revolution is the market's smallest portable amplifier at about the size of a disposable lighter. 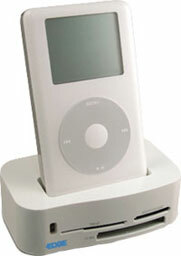 Initial units feature the same durable, high-gloss white plastic housing as iPods. Units in black, silver and a black/silver combination should appear on store shelves in November, just in time for holiday shopping. A tab and mounting hole allows users to attach it to a belt, key chain, or wear it around their neck. 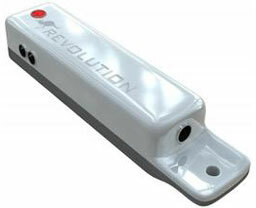 The Revolution carries a full 90-day money back guarantee and a one-year warranty on parts and services. UpBeat Audio's patent-pending circuitry separates and reprocesses compressed digital music files, opening up the field of sound. It splits conventional stereo signals into individual channels so listeners feel surrounded by rich sound, as if in a recording studio. It gives clarity, punch and driving bass. The Boostaroo Revolution features two standard mini-stereo ports with discreet circuits that allow two listeners to share music or movies at the same time - with no reduction in volume, no added distortion or noise. 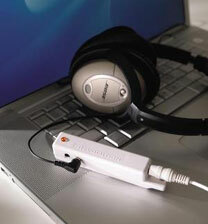 Users connect to their player of choice using one of two included patch cords, 3" and 6" in length (white version) or a 12" cord (black and silver versions). Plugging the Revolution into the headphone jack boosts the audio signal and extends player battery life by eliminating the need to increase the player's volume. The Revolution will provide about 24 hours of constant use. PR: TuneFilm includes three pieces of adhesive clear film to fit the iPod nano's color screen, click wheel, and the sensitive mirror finished back and provides protection for your iPod nano against dirt and scratching. 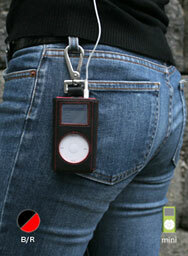 It is the perfect companion for your precious iPod nano. TuneFilm will be sold separately and it will also be included free with Prie Ambassador for iPod nano, Prie TuneTag nano, Prie TuneWallet nano, and IceWear nano. Keep an eye out, because it will also be included with more TuneWear iPod nano case products in the future. PR: Protect your iPod with the ezSkin nano. ezSkin nano uses high quality silicon with a special dust reducing coating to protect your iPod. The ezSkin nano comes with everything you need. An integrated belt clip, an ezShade nano screen protector, and a neck strap. The ezSkin nano comes in 5 stylish colors - Frost white - Sky Blue - Princess Pink - Lime Green - Onyx Black. Never let your nano Stop! With your new ezSkin nano. ezSkin nano Belt Clip - The ezSkin Removable belt clip is sturdy and made to last. ezSkin nano neck strap - The ezSkin removable neck strap is securely attached to reinforced silicon and is positioned so you can pick up your iPod nano and see the screen right side up. PR: A clearly unique way to protect and accessorize. IceFrame showcases the sleek form of your iPod nano. This crystal clear, two-piece shell is made of impact-resistant plastic and features a play-through design that gives you full access to your iPod nano's controls. Each IceFrame comes with four interchangeable Click Wheel accent rings (black, white, red and light blue) and matching connecting posts. IceFrame also gives you the freedom to change its colors to match your style, and the flexibility to attach the included lanyard in place of any connecting post. PR: The EDGE Dock & Multi Flash Card Reader for iPod allows you to sync your iPod, listen to music via external speakers, and charge your iPod, while also serving as a convenient multi flash card reader. The versatile device reads all popular flash card formats including xD Picture Card, SD Memory Cards, MultiMedia (MMC) Cards, Memory Stick, Memory Stick PRO, Memory Stick Duo, SmartMedia Cards, Type I/II CompactFlash Cards, and IBM Microdrive. The EDGE Dock & Multi Flash Card Reader for iPod utilizes a USB 2.0 interface (backwards compatible to USB 1.1) for high-speed data transfer between a computer and flash cards. Hot-Swappable - allows for quick and easy insertion and removal! 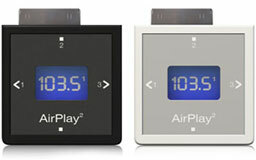 PR: Upgrade to the wireless convenience of the AirPlay2 FM Transmitter and never mess with the clutter of cords again! Simply plug AirPlay2 into any Dock Connector iPod, tune to the same frequency as your FM radio, and push play to hear your tunes through your stereo. It doesn't get any easier! AirPlay2 has sleek looks to match its superior performance. It' s just 7mm thin (same thickness of the iPod nano), has three programmable station preset buttons recessed in its flat face, and features a super-cool, large, bright LCD display for easy viewing, day or night. Powering AirPlay2 is a breeze as well. 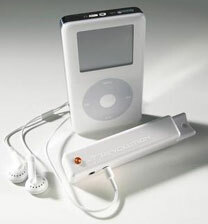 It draws its energy from the iPod, and when connected to a 30-pin charger can operate and charge the iPod at the same time. AirPlay2's ease of use, quality transmission, and groundbreaking design make it truly unbeatable. Available in both black and white models. Buy now and get free Shipping via UPS. You will not be billed until your product ships. Begins Shipping on November 1st. PR: Harman Kardon dealers are now taking preorders for the very cool Drive + Play iPod auto adapter. Drive + Play will be available for selected dealers to ship starting in early October, so you could be the first on your block to have the coolest interface available for in-vehicle browsing and control of your iPod. PR: ultraEars in-ear earphones incorporates a 9mm sound driver with Direct2Ear audio technology to provide you with clear treble sound and superb bass response. ultraEars come with 3 sizes of special ear fitting noise reducing sleeves to provide you with the best fit possible. This enhances sound quality and comfortable. The shape of the ear pieces provide a nice tight fit and bring the sound closer to you so you feel like you are right in the middle of music. The 9mm drivers and and ear pieces combine to deliver a strong bass signal. 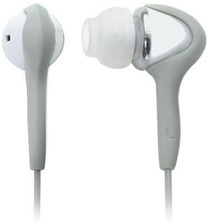 Three (3) Size of form fitting earpieces provide extra comfort, great fit, and noise reduction. White and grey finish compliments your iPod. 4 out of 5 Apples in Mac Home Magazine "ultraEars offer a very attractive mix of sound quality, comfort and the blocking of outside noise for a low price." The earPod is the perfect solution to prevent tangled or knotted wires. The earPods design makes it easy to store your earphones quickly and the felt lining protects your earbuds. The removable belt clip option allows you to wear your earPod and to shorten your earphone wire during use. The earPod is truly a complete earphone storage solution. PR: The first portable speakers designed specifically for iPod nano, MicroBlast is style, portability and protection - all cleverly rolled up into one lightweight, package. 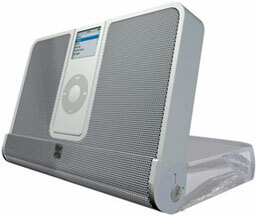 Simply slide your iPod nano into MicroBlast's dock and crank up its four great-sounding, amplified stereo speakers. It's powered by four AA batteries or an included AC adapter that enables you to play and charge your iPod nano at the same time. Better yet, MicroBlast's crystal clear protective cover allows you to safely leave iPod nano docked while on the go, and doubles as its base when then unit is open. MicroBlast includes both black and white interchangeable frames to match the color of your iPod nano, as well as a travel pouch. PR: Contour Design announces the Showcase Sport, a sleek, innovative version of the original Showcase. Using cutting edge manufacturing technology, the Showcase Sport offers advanced protection for Apple's click wheel 20 GB iPod, 30 GB iPod photo and 20 GB iPod with color display. The new Contour Showcase Sport has the same popular and outstanding design as the original Showcase. In line with Contour's design philosophy to protect the iPod, and also aesthetically complement the iPod's sleek look, the new Showcase Sport builds on this foundation with multiple enhancements and innovative features, such as a streamlined low profile and an intuitive sliding, secure latch. Contour Design has streamlined and redesigned the Showcase to produce the Showcase Sport. "Just when we thought we could not make a case any slimmer that offers the same "bullet proof" protection as the original Showcase, we went back to the drawing board, and came up with the Showcase Sport" says Ketan Vora, Spokesperson at Contour Design. He goes on to say "Consumers want a case that not only protects their iPod, but will also show off its aesthetic design. Our Showcase Sport does just that!" At Contour Design the focus is on quality in all aspects: from strength and durability to look and feel. The Showcase sport is not only lighter and more streamlined, it features advanced shock protection and offers a fast, intuitive latching system for those active users of iPods. Sleek, clean design: a seamless integration of clear, protective, durable, and new shock-absorbing materials. iPod screen perfectly visible through protective behind impact-resistant clear plastic. New Advanced secure slide latch mechanism for easy opening and closing. Top and bottom openings provide full access to connectors, headphone jack and hold switch; compatible with most popular iPod mountable accessories. Strong, detachable belt clip provides a secure, comfortable fit. Available in two colors, Black or White. Compatible with Apple's click wheel 20 GB iPod, 30 GB iPod photo and 20 GB iPod with color display. The Contour Showcase Sport will be available in 2 colors, black and white. The MSRP will be $32.99 and will be available the week of October 24, 2005, through Contour Design's extensive distributor and reseller partners. PR: Contour Design announces a brand new addition to its award winning iPod case line - The ToughShell. The ToughShell's lightweight transparent shock resistant material offers all round protection and durability for Apple's click wheel 20 GB iPod, 30 GB iPod photo and 20 GB iPod with color display. "With the ToughShell, we have introduced a brand new product into our existing range of cases," says Ketan Vora, Spokesperson at Contour Design. He goes on to state that, following extensive market research and feedback from existing customers, it was clear that users wanted a case that would be superior to "skin" cases, but still maintain a low profile and light weight - the result is the ToughShell. The ToughShell fits snugly and provides superior protection while maintaining the "WOW" factor that Contour Design is know for: protection while still showing off the sleek design of Apple's iPods. The ToughShell is made from enhanced transparent polypropylene, which not only provides all around protection but also complements the overall look and feel of the Apple iPod. The ToughShell secures the iPod by using an advanced snap-latch mechanism to ensure total protection while on the move. Enhanced polypropylene transparent case offering all around protection for Apple's click wheel 20 GB iPod, 30 GB iPod photo and 20 GB iPod with color display. Easy access to all the iPod's controls. Easy access to connectors, headphone jack, hold switch and most popular attachments such as FM transmitters, voice recorders etc. Advanced snap-latch mechanism to ensure total protection while on the move. Strong, detachable, stylish belt clip provides a secure, comfortable fit. The Contour ToughShell will be available the first week of November 2005, through Contour Design's extensive distributor and reseller partners. MSRP will be $21.95. 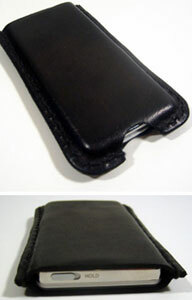 PR: Prie Ambassador for iPod is a versatile genuine leather case for iPod. Prie Ambassador is made from smooth ultra high quality genuine nappa leather and provides protection for your iPod against dirt and scratches. Prie Ambassador is available for the iPod nano, iPod 4G (all models including iPod photo) and iPod mini. This stylish case is also extremely versatile. You can can use the removable hook to attach your iPod to a belt loop or strap. There is also a removable belt clip so you can clip Prie Ambassador to a pocket or belt. Finally you can remove both the hook and the clip and simply use the case on it's own and slip it into a pocket or in a bag, knowing that you iPod is safe from scratches from keys or coins. You also have the option of clipping on your own strap (not included) to hang Prie Ambassador around your neck or shoulder. Elegant and masculine one-of-a-kind case for your nano! This hand-oiled leather stitched case is an exclusive item designed by Marty Flint to keep your new nano protected and looking awesome. Besides being 100% black leather and looking slick, this case was designed to keep it's shape even when the nano isn't inside. It's also got an opening at the bottom so you can easily slide your nano in and out of it's holder! Let your iPod make a statement or two! Now you can give your iPod a brand new look whenever you feel like it with these cute handmade iPod cases! Case designed to fit iPods: 4th generation (4G) iPod, both 20 MB and 40 MB OR minis (choose from the pulldown menu). Made of wool/acrylic blend felt and Velcro closure. Clear vinyl covering for screen and click wheel, designed for full usability of both. Hand sewn, with hand appliqué. Designed for accessibility of locking switch, headphone jack, and USB plug. Due to the extremely handmade "look" of these cases, each one will be a little different and will not be an exact fit. Please look at the pics on the left to see what we mean:-) Mini pictured. The coolest iPod Flip Covers Ever! These iPod cases make awesome fashion statements. Not only are they cool looking, they are extremely well-designed! Each cover is made with reinforced fabric, foam padding and a clear plastic casing. It's got an opening for a mic port, charging opening and Velcro closure. 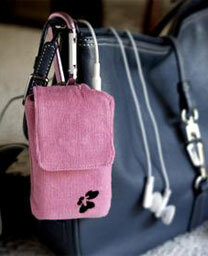 Gerbera Designs understands just how much you love your prized iPod and wants to help you protect it! *This computer design is a limited edition case. PR: Kiwali LLC, a designer and maker of digital lifestyle accessories, debuted an exciting collection of 20 removable designer vinyl "skins" for the Apple iPod Shuffle. Kiwali LLC is pleased to announce the release of its debut collection of removable vinyl "skins" for the Apple iPod® Shuffle. Featuring 20 very unique and exciting designs, Kiwali ShuffleDeco is made from a high-quality vinyl backed by a removable adhesive. The original designs are printed on vinyl using a 4-color process and coated with a protective water-resistant coating. Once applied, ShuffleDeco transforms the iPod Shuffle into an "art-on-a-stick" conversation piece. "What really sets ShuffleDeco apart from the competition is the quality and originality of our designs," said Paul Lee, Director of Marketing for Kiwali LLC. "With names like 'Acid Bat,' 'Gamma Gurl,' and 'Chinese Dragon,' we have amazing designs for those individuals looking for something truly unique and different." The Kiwali ShuffleDeco provides protection from scratches and everyday hazards, but removes easily without leaving a hard-to-clean residue. 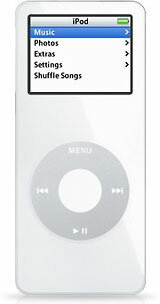 The two-piece construction covers the face of the iPod Shuffle and all four sides, but features a "backless" design that allows the user to enjoy the original color and finish of the iPod Shuffle. The Kiwali ShuffleDeco is an easy and affordable way to accessorize the iPod Shuffle to reflect an individual's personality, mood, or taste. Individual designs are available immediately for a suggested retail price of $5. The "ShuffleDeco Ultimate Mix Pack" features all 20 designs of the debut collection for $29. For a limited time, customers who place an order via the website will receive a bonus ShuffleDeco for each ShuffleDeco ordered. Reseller and distributor inquiries are welcome at this time. PR: The Kiwali Mineon is a soft and sleek case for the iPod mini. Made from natural corduroy and available in five dazzling colors, the Mineon is a stylish way to keep your iPod mini safe from the dangers of a cold and cruel world. Each Mineon comes with a stylish metallic carabiner clip for carrying convenience. Pick your favorite color or buy one as a gift. Made of soft natural corduroy. Surface-washable. Do not machine wash for the love of chocolate and jazz. Fits the iPod mini 4 GB and 6 GB versions. Available in 5 dazzling colors to match both your iPod mini and your outfit. Comes included with your choice of one of 5 metallic carabiners clips for hands-free carrying convenience. Included carabiners are fashion accessories and are not designed for climbing. (Like, duh). Magnetic clasp for easy open and snappy close. Access cutaway in the cover for headphone plugs. Nice and snug fit, like a favorite pair of corduroy jeans. Makes your iPod mini feel loved. Anthropomorphically speaking, of course. PR: New ebook helps readers use their iPods for more than music. Turn your iPod into a PDA, backup drive, ebook reader, and more. Have you ever wondered what your iPod could do beyond playing music? So did Steve Sande, PDA expert and longtime editor of The Gizmo Ranch. For this ebook, he researched every nonmusical use of the iPod, providing step-by-step instructions and real-world advice about how to use your iPod as a read-only PDA for calendar events and contacts, off-load photos to it from a digital camera, back up your computer to your iPod, set it to put you to sleep at night and wake you up in the morning, and even keep it ready as an emergency boot drive should your computer's hard drive fail. Want more? With Steve's help you can use your iPod to give presentations, and with assistance from free software, you can read text-based electronic books, play games, and even install and use Linux. And although Steve's goal is to help you take your iPod beyond the music, he provides basic usage instructions for those getting started with the iPod, plus how to listen to podcasts, prerecorded audio books, and text-based iBooks. Looking to buy a new or used iPod? A detailed appendix helps you sort out the members of the iPod family and provides a complete timeline of iPod releases. This ebook covers the just-released iPod nano and iTunes 5, and provides instructions for both Mac OS X and Windows users. And if Apple announces yet another new iPod during the company's October 12th special event, you can depend on us to release a free update to keep the ebook current. Take Control publisher Adam Engst said, "Given Apple's constant stream of iPod and iTunes announcements, an electronic book is the ideal way for readers to learn about the iPod in depth without worrying about information obsolescence. Steve included details about the recently released iTunes 5 and iPod nano, and - as with all Take Control iBooks - we're committed to releasing free minor updates should Apple spring yet another iPod on us at the October 12th special event." Free 31-page PDF sample with Table of Contents, Introduction, Quick Start, and section starts. PR: iFill streams MP3 files from thousands of free radio stations directly to your iPod. You can choose several stations at once and select from many different genres. And since iFill goes directly to your iPod, it won't clutter up your hard drive with extra files. iFill is a great fit for your active lifestyle. With iFill, you can go to bed while charging your iPod, and wake up to an iPod full of new music, ready to go jogging with you, and without having to search through your record collection, browse the iTunes Store, or rip any CDs. Done! Fresh music starts streaming to your iPod. We all know how it is: You wake up in the morning, you're late and in a hurry (who isn't?). With iFill, all you have to do is eject the iPod and go! There's simply no faster way to work it. Everybody loves iTunes. So you won't have to switch between programs, we've built the iTunes basics into iFill. So you can manage iFill (and your iPod) using the familiar iTunes interface. iFill is designed for easy use, and includes features specifically designed to help you in your enjoyment of streaming webcasts. Many online radio stations send song information that's not exactly in sync with the audio. iFill provides an intuitive graphical editor that allows you to correct the syncing. Plus tons of other features that help keep a world of fresh content at your fingertips. iFill is only for your personal use. Radio content may contain copyrighted or proprietary material, so recordings made with iFill should not be sold or played for a public audience. Please don't infringe on copyright holders' rights by copying or distributing their material without permission. We at Griffin urge you to respect other peoples' rights. With great power comes great responsibility. Please play fair! Timeshift: iFill adds a virtual FM tuner to your iPod. And unlike real radio you can skip songs with timeshift technology. 1 hour = 5 hours? Stream several stations at once and fill your iPod in a fraction of the time. Surprise, surprise! Get new music every day and mix up any genres. Surprise yourself with music you've never heard before. Music unlimited: Thousands of stations deliver more music than you can imagine. Your favorite station included! Perfect integration: iFill does not depend on iTunes. So everything you put on your iPod does not clutter up your Mac. System requirements: Mac OS X 10.3 and 10.4 or Windows XP with any iPod.